Les Acrostiches: C'est quoi ce cirque! Last night, during Le Jongleur, Festival Nez Rouges’ penultimate show, I spent some time wishing Nikolaus the juggler would juggle more. Ten minutes into tonight’s festival finale, I am already wishing that Les Acrostiches would juggle less. C’est quoi ce cirque! is opposite in many ways to Le Jongleur. The latter featured a multi-talented artist exploring one simple idea whilst not really using those skills to the extent they deserved. In contrast, there are five Acrostiches – three basically characterless 'acrobats' who perform the odd cartwheel, some very standard juggling tricks, and a little bit of handbalancing – and two musicians. One of these musicians is a promising clown (the only one I can see fitting into the Red Nose category) and he leads the show with almost interesting percussion routines that would be great in a teambuilding workshop. 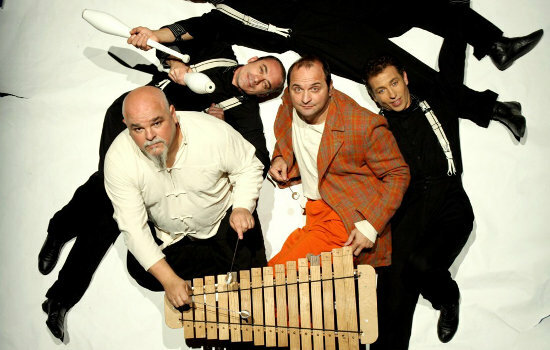 The show mixes these group percussion interludes with the aforementioned juggling, some 'comedy' songs and one or two other, miscellaneous performance sections. An example – one acrobat stands on his hands whilst attempting to talk about his interest in philosophy; the others fool around and make fun of him. There is apparently no structure to the piece, no idea running through to explain why we are here tonight, what exactly we are watching. The title ('What is it, this circus?') is also a pun meaning something like ‘What on earth is this terrible mess?’. I wonder whether this is a question Les Acrostiches asked themselves of the show when the festival’s marketing team rang. Having said all this, I cannot overlook the fact that I had to hunt for a seat in the large auditorium, fifteen minutes before the show was scheduled to start. There was even a coach parked outside. People laughed, people clapped along. So what am I missing? Did this English audience member miss some subtle linguistic nuances in the 'comedy' songs, or cultural sensitivities in the seemingly random performance sections? The content was so simple that it seems unlikely, but I left the theatre baffled. Not least because it wasn’t clear why the show had ended. It came to an abrupt stop, just after a nice enough four-part harmony Peruvian piece with a ukulele, stylophone, and maracas. There was no logic to its ending there – another contrast with Le Jongleur, whose slowly built finale moment was a mechanical failure, but nevertheless a culmination of the thought and work the artist had put into the piece. I’m not saying a show needs a grand finale, but C’est quoi ce cirque! definitely needs something more, even if it's just a bit of variety to salvage it as a 'variety show for all the family' – as at the moment it is short even of that mark.